The white Hazrat Sultan mosque was completed in 2012 and is the largest mosque in Kazakhstan and Central Asia. Established in 2009, the Kazach national university of arts consists of a blue conical building located on Independence square, a huge square east of the presidential palace. The Palace of Independence is located on the same square and houses a scale model of how Astana is supposed to look in the year 2030. The Kazakh Eli monument consists of a colonnade, a huge arch, a column and a set of statues. It is meant to symbolise the historic destiny of the people of Kazakhstan. 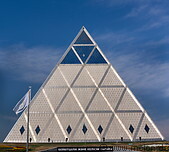 The Palace of Peace and Reconciliation is a huge white glass and steel pyramid with a blue top.